Now that weed is legal in a few American outposts, business ideas are flowing to make sure that sticky green stuff is accessible. Case in point: Magical Butter's food truck, which whips up "four-star food items" infused with marijuana. This bake-bus has already seen action at the pot smokin' party called the Cannibus Cup in Denver, look for it in Seattle soon. Magical Butter is a company that makes a "botanical extractor." This device pulls nutrients, or whatever, out of plants and can inject it into into butter, cooking oils, alcohol (tinctures) and lotions. I don't have the science to explain it all to you stoners, but you know how it takes fat people more time to pass a drug test? Same principle: THC, the "effective" element in weed so to speak, sticks to fat cells. This extractor is a thing you can buy. In an effort to let more people know that, Magical Butter is rolling out a 40' Freightliner C2 School bus dubbed the "SAMICH Truck;" for "Savory Accessible Marijuana Infused Culinary Happiness." Executive Chefs Joey Galleano and Jeremy Cooper will be cooking up "marijuana-friendly" foods on a rotating menu with things like grilled cheese, tomato soup, and sandwiches all made using the top-of-the-line Magic Butter device called "MB2." 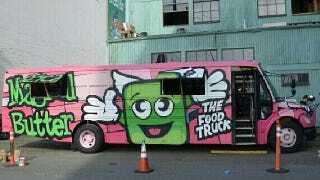 CEO and Founder of MagicalButter Garyn Angel told The 420 Times he's working on a smartphone app to tell you where the truck's at, a brick-and-mortar restaurant in Seattle where the company's based, and eventually an entire fleet of trucks hocking ganja-glazed grub.